PROMOTING ALL ASPECTS OF SUCCESSFUL TEAM TRAINING AND PERFORMANCE. Killary’s team building programmes are as varied as the teams that participate in them. Each programme can be adjusted and focused to meet your group’s requirements and aims. Our team building activities have been designed to ensure maximum engagement and interaction and hence a highly productive experience. Our team has experience in leading expeditions from Greenland to Antarctica and the Amazon to Guinea Bissau. These inhospitable journeys have thought us what makes a team, and what breaks a team. 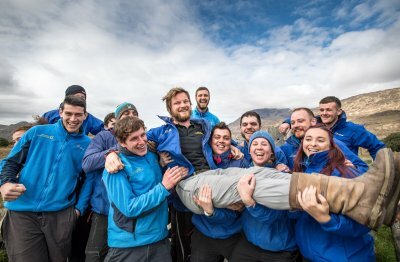 So whether you are looking for a rewarding, fun day out or a tailored, facilitated team building day with tangible results, our programmes will exactly match your needs. Whether it is a half day program or a 3 day wilderness journey we can, and probably have already, facilitated it. We have over 35 years’ experience working through the outdoors with teams, both corporate and sports. We have successfully worked with companies from Google and Facebook to Shannon Aerospace and the Irish Management Institute. And sports teams from the Clare hurlers and Leinster rugby to Clontarf Rugby club and Renvyle GAA club. We also organised the Gay Byrne survivor show, I'm a celebrity get me out of here – Irish edition, Ireland's fittest families and Noel Edmonds house party. We also have a long history of leading successful, global adventure expeditions. See our team for a list of global expeditions we have been on. Let us apply all of this knowledge for the benefit of your team. Thinking of something to energise your staff and break the routine of your working schedule without having to worry about the logistics ? We will bring the event to You!